Food markets for converted flexible packaging accounted for 71% of total demand in 2016 and are expected to rise to $15.5 billion in 2021. U.S. demand for converted flexible packaging is expected to rise 3.2% per year to $21.7 billion in 2021. Ongoing product introductions and trends favoring smaller package sizes will fuel opportunities, as will the need for enhanced shelf life and package resealability. These and other trends are presented in Converted Flexible Packaging Market in the U.S. , 14th edition, a new study from the Freedonia Group, a Cleveland-based industry research firm. 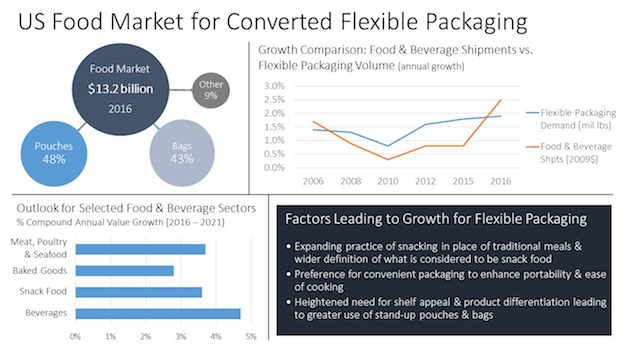 Because most advances in demand for converted flexible packaging are the result of transitions from low-value products to high-performance packaging systems, pouches will remain the fastest-growing major flexible packaging product, said the study. Most of the gains for pouches will be the result of greater use of stand-up pouches for the packaging of snacks, baked goods and pourable materials like beverages, soaps, sauces, condiments and baby food. Further inroads by pouches into rigid beverage container applications are supported by the availability of spout fitments that enable resealability and provide improved dispensing. In the meat market, gains will reflect the significance of case-ready fresh meats and convenience-oriented products, such as pre-seasoned meats and individually wrapped portions. Snack food gains will be the result of heightened interest in better-for-you snacks, which generally have higher barrier requirements and are packaged in distinctive stand-up pouches. Many food products are packaged in flexible formats due to the small average package volume and cost sensitivity of food manufacturers. Lightweight bags and pouches see widespread use in the unit packaging of meat and poultry, baked goods, snacks, candy, pet food and frozen food. Growth has been based on the ability to provide improved, cost-effective methods of protecting food from contamination while enhancing its shelf life and visual appeal. Improvements in reclosing features will continue to enhance prospects for bags and pouches versus rigid containers in most food markets. Demographics and lifestyle factors will also drive gains for flexible packaging, said the Freedonia Group study. Some of those include shrinking household sizes, the rise of dual-income families and the trend of snacking in place of traditional meals, all of which will promote demand for pouches in small or single-use sizes. Despite widespread interest in food, consumers generally do not want to spend time preparing meals from scratch, instead opting for foods that offer convenience and quick preparation. At the same time, there is a move toward fresh and minimally processed foods rather than traditional store packaged food products.